Valentine’s Day is 3 weeks from now, a period when we spend billions of $ to “prove” our love. For me personally, I would rather not have a lot of money spent on meaningless gifts. Over the years, my husband has tried getting me the dozen roses or expensive jewelry, but has now come to realize that I value the simple things when done with genuine thought and feeling. There are plenty of frugal date ideas to make Valentine’s Day special without tearing your wallet to shreds. But for me, the recipe that hits the heart every time has three simple ingredients – Appreciation, Care and Respect. DH gets up early that day and makes me my favorite breakfast and a hot chocolate which is all ready by the time I wake up. We have a relaxed breakfast in the patio just enjoying each other’s company. While he gets ready for work, I cook some of his favorite dishes and add a note to his lunch bag saying how much he means to me. Sometime during the day he sends me an email with all the things he appreciated about me the past year and what our being together means to him. We both get off work early (and if you know my husband you will realize what a significant event this is, for him to leave work at a sane hour). He usually brings home a bouquet of flowers and my favorite brand of chocolate. We then spend time cooking a delicious meal together which we then have at home in candlelight with some wine. The point I’m trying to make is that we both spend time trying to appreciate each other and express that rather than buying expensive gifts. From my point of view, the effort DH puts in to prepare breakfast for me, send me a note expressing his love and generally showing me how much I’m appreciated is better than any gift. We all lead busy lives and it is very difficult to appreciate our partners every single day (and honestly, sometimes, I don’t feel very appreciative of him :)). If there is anything that is bothering your spouse, set some time aside to talk about it. We try to gloss over the problem by buying flowers or some other stuff. Show that you care about how he/she feels. After a few years, we get very comfortable with each other and take the other person for granted. This would be a good time to ask yourself how much your spouse means to you. Take some time to think about how he/she has made your life better and the happiness that they bring you. Do not take your spouse for granted. If you are giving a gift, make it thoughtful rather than flashy. 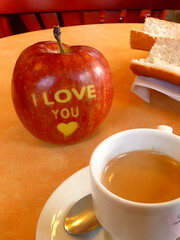 Give something that you make or even write a note about how much your spouse means to you. We might be in a relationship, but each of us is a unique individual. Your way of doing things might be different than your spouse’s. Accept that; cherish them for who they are. Showing someone that you love, respect and care for them will go a very long way. Use Valentine’s Day as a day to renew your appreciation of one another and show your spouse what he/she means to you rather than as another day to burn a hole in your pocketbook. What is your plan for the Valentine’s Day? What a nice way to spend Valentine’s Day. I do something similar but different. I pick up some flowers (simple inexpensive bouquet) and dinner. We celebrate at home with candlelight and depending on the weather a fire in the fireplace. We give each other an inexpensive gift that we enjoy such a favorite cookie or something. It is relatively inexpensive (under $30 total) and a quiet way to spend V Day. Home made gifts are always a hit at our house. Especially on Valentines Day. The one thing I won’t do however, is spend money on a Hallmark card. I like to make mine myself. Have not bought a real card in over 5 years! My wife and I only do cards on days like Valentines because we both know that a well-thought out note means more than spending too much money on a fancy gift. great tips kay lynn, I dont really have any plans for valentines day quite yet. It will probably just be a dinner out or something, but maybe not even that much. We do small stuff at our house, too. We both enjoy writing poems instead of buying cards and we always make a special dinner at home. Valentines is very special because it’s just about us. I absolutely love what I just read. Isn’t it nice to sit on the patio and just enjoy each other? The other day my wife said let’s have a picnic style dinner in the middle of the living room floor. I have to say it was very memorable. I might just use a theme or 2 of hers for Valentine’s this year. The best thing in our relationship is we do not expect anything special from each other on this day. When expectation is less the spending naturally follows. I think the simple celebrations are the best. My husband and I live in different countries, but I received some lingerie from him yesterday. He said he did not want to miss V-Day so he sent the present very early. I am not sure what I will do for him.